Pike Records was founded in 1959 by Roy Flowers in Bakersfield, California. Both Roy and his wife Vancie originally hailed from Oklahoma but moved to California in the 1950s. At the same moment, Flowers also set up his publishing firm Flowers Music Publ. The first record of the label shows Arvin, California, as location but all subsequent singles show Bakersfield. The label's initial release was by Flower's wife Vancie, who was a talented singer in her own right. Her musical repertoire included Rockabilly, Blues, Country, and even Pop hits of the day. By 1961 she was under contract with the publishing company American Music, Inc. from Hollywood (Jerry Capehart and Terry Fell worked for this company, too) while recording for Pike. 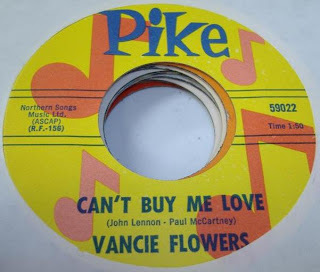 Flowers recorded for example a cover of the Beatles' "Can't Buy Me Love" (written by Paul McCartney and John Lennon) and an answer song to Dave Dudley's 1963 hit "Six Days on the Road" entitled "Six Days a Waiting." She also had a single out on Crest. Another artist that had a couple of singles out on Pike was Leon Hart. Hart went on to play an important role because he purchased 50 percent of the company soon after starting to record for Pike. Flowers and co-owner Hart prolifically recorded artists during the next two years. One of these local artists was Arizona born Dickie Garland, who had written some songs and contacted Hart. Hart in turn set up his own management firm and got Garland on Pike Records. The Rialtos, a local group from the Californian Central Valley area, were chosen to be the backing band on Garland's first session, which produced "Lonely Hitchiker" b/w "Please Don't Pretend." He had another release out in 1961 with "Shake Bop." The Rialtos, formed in 1961 by singer Bobby Hollister, had two records on Pike in their own right. The first one was released in 1961 and comprised two Surf instrumentals. The second one was a Rock'n'Roll/teen ballad cut with Hollister on vocals. The Rialtos also did a few gigs in the early 1960s with Della Quinn and her brother, known as the Quinn Teens. They had a release on Pike under their own name (Pike #5922 "Dickie" / "I Hurt So"). Another of the Quinn siblings later married Rialtos lead guitarist Freddie Thomas' sister. Classic Rockabilly Al Hendrix artist also recorded his "Monkey Bite" for Pike in 1962. Other artists on the label were Ronnie Sessions, Bill Bryan, J.R. LaRue and many others. Tommy Dee waxed a tribute to Buddy Holly, Ritchie Vallens and J.P. Richardson together with Bonnie Owens in 1963 for Pike entitled "Missing on a Mountain." The label was active until the mid-1960s but Flowers and Hart relaunched it in 1978 for some time. This incarnation lasted at least until 1984. By that point, the company was located at 420 Oswell Street in Bakersfield. Vancie Flowers died in 2008. No#: James Gilreath - Lollipops, Lace, and Lipstick / ? I should have added in first post that "Missing On A Mountain" is about the Patsy Cline, Cowboy Copas, & Hawkshaw Hawkins plane crash. Bonnie Owens sings, Tommy Dee does recitation. Also Vancie is wife to Roy. I'm looking at a 45 my sister, Della Quinn, wrote and recorded on Pike Records. I sang with her. It was around the early 1960"s. I was only 11 or 12 years old. The number on the record is P-5922. Our connection was with Leon and Millie Hart in Bakersfield. My brother married Freddie Thomas's (the Rialto's) sister. The songs on the record is Dickie and flip side, I Hurt So. Do you have any knowledge of this record? Interesting Blog. Della and I sang with Bob Hollister and Freddie at some gigs. Sooo long ago. We we listed as the Quinn Teens. Thank you Mr. Quinn for sharing your memories. I have added some of the facts you provided to my post but unfortunately, I have no other info on your record. My aunt was Millie Hart(dads sister) I stayed with them in Oildale in the early sixties. Lost track of Leon Hart any news is welcome. The B-side of Pike 5908 (Little Ronnie Sessions - 12 Years Old) is "A Lot On My Conscience Today." I see you have a lot info. about my mom an dad, Roy Vancie Flowers how ever some things are incorrect. 1.They came to Calif.in the middle forties 2.Dad passed away in 2008 mom passed one year an 18 days later in 2009. 3.Dad worked as foreman on a ranch for some time did not start the music label until later. Mom was on the Cousin Herb Henson's show several times when Roy Clark was there. She knew most of the locals who played country music. Lori, thank you very much for your input. Would you please contact me via email? You can find my adress on my profile page. I'm curious about Pike and your parents' career in music!